to Jean and William Gosney. Garry was an only child, and a loner. He was different from other children, mainly due the the fact he was so tall for his age- and his mind was so bright. He learned quickly, but like most children with his disabilities, ( dyslexia, and later diagnosed as an adult with ADHD & ADD) he sadly lacked concentration, and his schoolwork suffered badly- his love of being on the farm suited him and his love of horses has never faded. and bad because he cant read properly- the dyslexia causes that - he has explained it as being able to see a page with writing which just goes blank when you try to read it. Even as an adult he scans the headlines and does not read very much for very long because he has to absorb what he reads in a few seconds or forget it. His adulthood saw him emerge a troubled and saddened youth- Very few understood or helped him and he grew up with a chip on his shoulder about the school system- he wanted to learn but was just unable to- no matter how he tried- nothing changed. His towering height made him the brunt of taunts at school and he was very much a loner-(he was 6' tall at 12 years of age) He reached the height of 6'4" (193)cms as an adult. Garry has an amazing ability to foresee the future way of things, but is unable to harness these visions, hence the start of his writing- because of his frustration at not being able to coherently express himself properly - his greatest teacher and companion has become his computer weather its his desk top of his laptop- they are constantly within reach- he can refer back to things with incredible accuracy, and knows his laws and rules articulately. Unorthodox, Outspoken, Unconventional, Controversial, Garry the Adult is all of these and more. He never backs down from a verbal argument, and determinedly explains himself to others. I would think this comes from being picked on all the time as a child, he in never violent physically- probably due to his injuries over time. His soft side comes through when he speaks of his children (4boys, 1 girl) to his first wife, Karen. One only has to see him at his favourite past-time of fishing and see how much effort he puts into teaching any children the right way to fish. he is totally generous and often gives away all his nights catch to some poor fisherperson who is down on their luck, especially if it is a child. 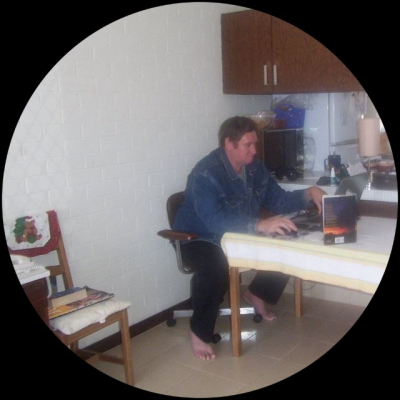 In his first book- One Aussies Endeavours, by the nic of Perth Desperado,******* he combined poetry about his life, his family, his travels, his loves, and his thoughts, all intertwined with photographs of his travels, and a few photos are actually about the poem near it. Knowing a bit about Garry the man, this book is like reading his diary. As you read Garry's books, you will discover that although Garry has a deeply religous belief he is not a Catholic, despite his schooling. He is able to put words to paper and with so much intense feelings showing through, even though he has never read one of his books after print. Reading his poetry makes you feel as if he wrote especially for you, the reader. Its an amazing talent, and his way with words comes through very clearly- depsite the odd mis-spelt word in the book- No-one has actually edited the books and although there are a few errors,his words are clear and simple. His total faith in what he says and does comes shining through, even though some others cannot follow what he is meaning. After many jobs in his lifetime, he was never a total career person, frequently changing jobs and directions.His work was always planned and methodical, and after a very bad accident and then botched surgery which has left him with totally unbearable nerve damage and pain - especially to his wrists and shoulders, back, and head - he rarely complains , and will take himself off to go fishing. he loves nature and his photographs will show the most amazing pictures of nature, sunsets, storms, ocean - you name it he photographs it. His travels to America saw him find a peace within and he is longing to return there - as he says to return "home". Garry's Second Book Controversial Dreams. Wishes,Hopes, Lyrics, sees more of his work - if you read from book one- through to book three- it is almost like reading a diary- his life although not directly said has been saddened by the breaking of his first marriage, the loss of access of his children, who lived only a short distance but never saw him, his travels overseas,then home again, divorce, separation from family, dreams and wishes and hopes all brought together to hopefully complete his life. As I write this review, Garry Has another 3 books ready for printing, and is not far off producing a small book called his Christmas book. As an incredibly outspoken person, Garry argues the point of law with government officials and anyone else who is in the wrong- and is quick to quote rules, laws and by laws- his honesty as a person and not being able to express himself otherwise will see him become outrageously outspoken with officials. His need to express himself articulately shows through, and his manner is of one very used to being patient and perseverent- he just cant tolerate injustice and dishonesty..much less people who dont care about their job, or who they represent when they are sellin one something. Keep up the good work never let your dreams go. Show them and love them with all his being. Reliving their past, present and future still hidden. At the time when he has settled?